With lots of Chinese elements, the creators of the film "Crazy Rich Asians" hoped to embrace Chinese culture and the local market, however, this film looks exotic to Chinese as to how it looks to the rest of the world. 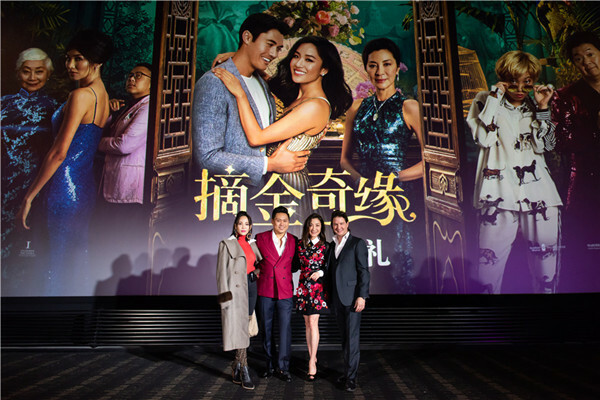 The romantic film, directed by Chinese American filmmaker Jon M. Chu and starring Constance Wu, Henry Golding, Gemma Chan, Nico Santos, Lisa Lu, Awkwafina, Ken Jeong and Michelle Yeoh, debuted in China last weekend. It is based on the 2013 novel of the same name by Kevin Kwan, telling the story of a Chinese American professor who travels to meet her boyfriend's family and is surprised to discover they top the list of rich Singaporeans. One attraction, and a curiosity, for the audience is gaining an insight into how the richest Asians live their lives and uphold national traditions, as, in reality China has become the second largest economy in the world with many newly rich families. However, most audiences will find "Crazy Rich Asians" is just another Cinderella story wearing an Asian skin. In the Chinese market, "Crazy Rich Asians" has a different Chinese title, literally translated as "Amazing Romance When Reaching for Gold"; however, Jon M. Chu said his film is not about a gold digger. "Kevin Kwan's novel is about fashion, wealth and love. I want to explore and express something deeper and wider. Actually, the core elements of the film are love and family. It doesn't really matter whether you are a crazy rich man," Chu added. The director also hoped to pay tribute to Chinese families and the older generation, and also wanted to open a new era for Asian stories and actors in Hollywood. Apparently, he made it. In the United States, "Crazy Rich Asians" just as with "Black Panther" for the black community, made many Asians feel proud to see the first film by a major Hollywood studio to feature a majority Asian American cast in a modern setting since "The Joy Luck Club" in 1993. In many aspects, therefore, this is a great triumph. The Asian-focused film topped the box office in North America for three consecutive weeks in August. It received mostly positive reviews from critics, grossing US$238 million worldwide thus far, according to BoxOfficeMojo.com, making it the highest-grossing romantic comedy in a decade. However, at a seminar on the theme of "Transnational Asian American Speaker Series: Crazy Rich Asian: Race, Representation, Resistance?" held at Barnard College in New York on Oct. 23, Asian participants divided somewhat awkwardly on the film. For instance, one Singaporean audience member pointed out the film doesn't really relate to the real life of Singaporean people, while an Indian participant said Americans always ignored Indians in their definition of "Asians".